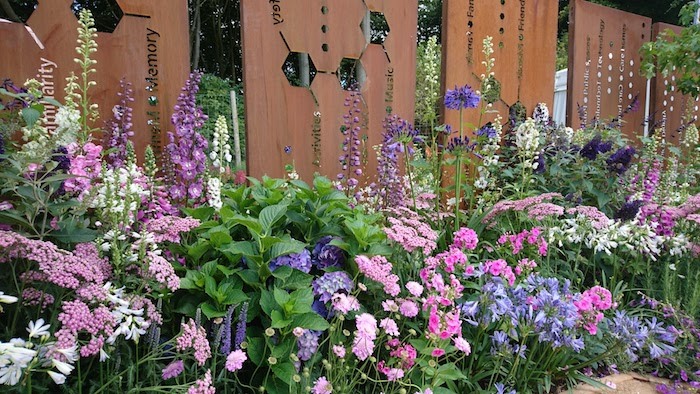 By Cheshire based garden designers Jane Bingham and Penny Hearn. A conceptual garden created to support the Mid Cheshire Hospital Charity’s ‘Everybody Knows Somebody’ dementia appeal. The design, structures and planting are symbolic and depict the journey a dementia patient takes from first diagnosis through to requiring 24 hour care. 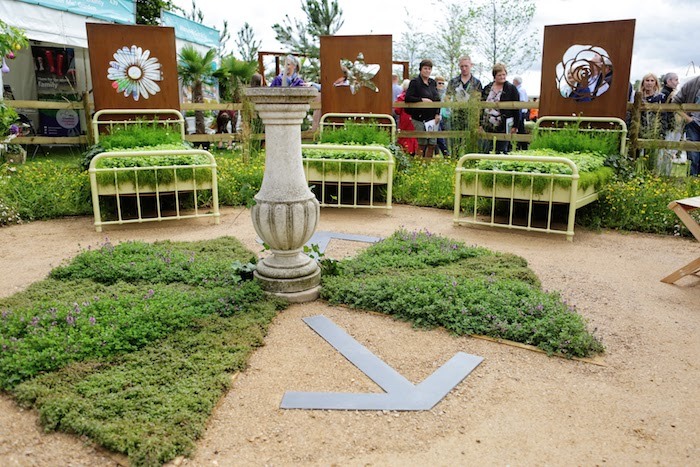 The planting at the entrance of the garden represented the lucid mind and cohesive thought. Travelling through the garden the planting becomes more faded and muddled ending up in a completely mixed up wildflower meadow. The corten screens were laser cut with key words describing the dementia patient's journey. The clock hands were set at five o'clock to represent Sun Downing Syndrome which affects dementia patients at that time of day. They become agitated because they feel like they should be doing something like coming home from work, making the dinner or bathing the children. 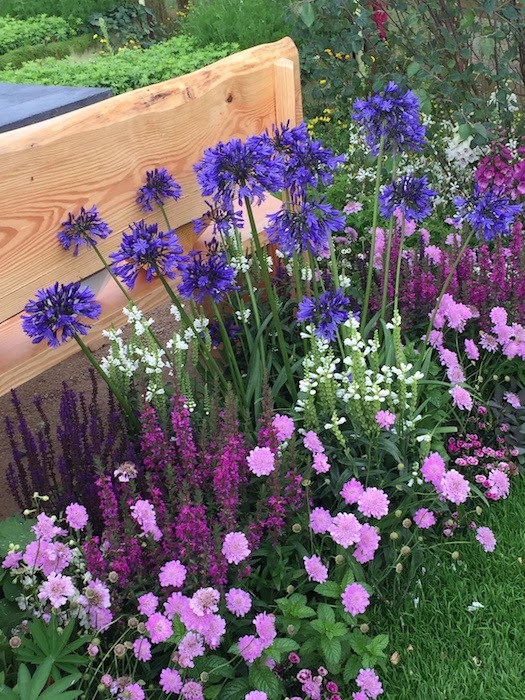 Jane and Penny included 'old-fashioned' herbaceous perennials such as delphiniums and phlox and shrubs such as hydrangeas and buddleja. White appears more and more in the planting, representing gaps in memory. 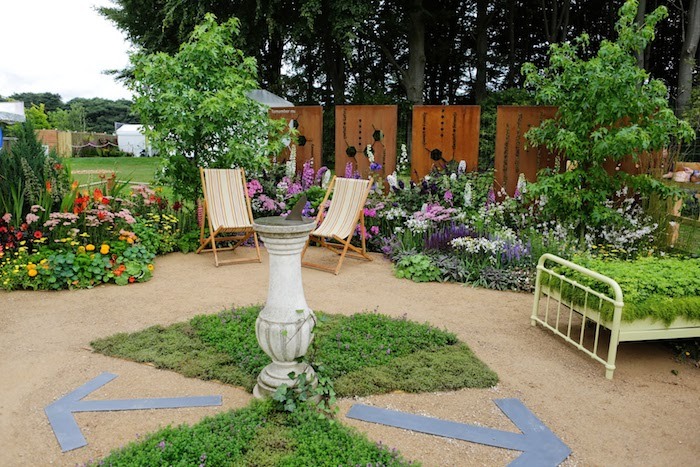 Other key features in the garden are the ‘Room of Inklings’ by Wendy Connelly of RAW-i Studios and the benches by Simon O’Rourke Tree Carving.